I like this bridge that accommodates vehicles, pedestrians and cyclists*. In this my second year of stroke recovery, I am often tempted to think about what I cannot do. I fight that temptation by celebrating even the most minor of firsts and advances in movement and daily living skills. Friday offered two opportunities to celebrate. With walking buddy Pat, I walked on the “new” bridge that spans Biloxi Bay and connects Ocean Springs with Biloxi. It has been on my wish list for a while, but I was reluctant for two reasons. First, I anticipated difficulty with the incline. The old bridge demolished by Hurricane Katrina was a drawbridge and not that high. The replacement bridge arches extremely high to allow passage of shrimp boats, tug boats, sailboats and other pleasure craft. But it also has a wide section that accommodates pedestrians and cyclists south of the eastbound lanes, and draws walkers at all hours. The second challenge, in my mind, at least, is that there is nowhere to sit down and rest until about the highest point. I had set a goal to walk the entire mile-long paved walk on Ocean Springs’ front beach before tackling the bridge. But, as with other challenges that have seemed to be overwhelming, I finally realized that I could rearrange the order of those goals any way I wanted. I didn’t have to wait until I conquered the entire length of the beach walk to give the bridge a try. I also did not have to accomplish the entire 3+ mile roundtrip bridge walk on the first try. I could indulge in a change of scenery and the immediate gratification of a short walk on the bridge, getting a feel for the incline and then heading back—a doable walk. Pat, a veteran of walking the bridge roundtrip from beginning to end, was ready. For an August day, Friday’s temperature was mild, skies were just a bit overcast, adding to our comfort, and best of all, the breeze was invigorating. At the one-tenth mile marker, I was not tired but decided to turn back to be sure I handled the downward slope with ample energy. Once off the bridge, I had more than enough energy left for a good session on the beach walk and, with Pat’s help, exercises for loosening my left shoulder and for strengthening and lengthening weak arm, hand and back muscles on my left side. Success, large or small, is a great encourager. After lunch and a rest, I tackled another challenge I had been avoiding. I have been reluctant, no, make that a big chicken, to walk alone in our backyard, let alone attempt gardening. I used my hiking stick, and navigated a turn around our overgrown vegetable garden plots. I checked out what I would need help with in order to get started on some independent weeding and prep for a fall garden. I also checked on the condition and location of tools and supplies. No falls marred my outing. My most uncomfortable moments were getting out one door and entering the other side of our house through a screen door on our screened porch. Different doors, different anxiety factors. On our visit to the Smoky Mountains in July, I had eventually developed effective strategies for entering and exiting the extra-heavy doors of restroom facilities in the National Park. Most of those doors closed so quickly they threatened to topple me over. The exterior doors in our home present less of a challenge. I know now that I will gradually deal with them comfortably and navigate gardening solo, as well. There remains much that I have to figure out before I will feel safe gardening when I am totally alone at home, but the fear is gone. Inch by inch is the way I go, oh, so slow but definitely in the right direction. 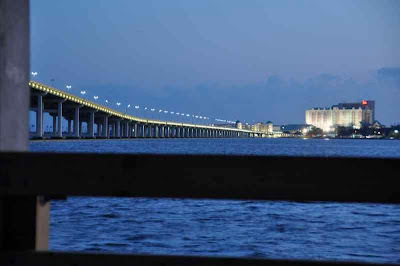 *Husband Walter captured the bridge image during a sunset walk we took on a newly opened fishing pier, another post-Katrina replacement. I had no idea there would be so many challenges. Just getting in and out of doors can really be daunting. I love the way you conquer your fears and then conquer those goals along way too. I'm so glad you have good supporters and partners along the way. Thank you for being brave enough to share your post-stroke fears and challenges with us. I simply had no idea of all of the things that we simply ignore each day, not ever dreaming that they present such a challenge during your recovery--like doors. I'm absolutely thrilled to hear that you are contemplating getting back to gardening in the future! It will help refresh your mind and spirit like nothing else :) You go girl!!! Wow, if you can walk that bridge part of the way and can garden solo, you are definitely in better shape than I am. Way to go, LC!!! Many thanks to you four for your encouragement. But Gigi, don't picture me out doing major gardening and boldly striding to the top of that bridge. My progress inch by inch was not just a figure of speech. That really is how I have to break things down, into minute segments. But a bunch of inches added together will eventually make a mile! Each minute step is a great milestone.As with the tortise and the hare, slow and steady win the race. I'm glad you are attempting the gardening too. Pure therapy that's for sure. I really appreciate your honesty and your sharing your life strides with us. You absolutely put me to shame. I desperately need to walk again but can't face the solitariness of it. My fears are different from yours, but you are conquering yours while I let mine conquer me.